I was asked to write this by someone that I thought would do it more justice than I could. I thought I would make it too personal but having talked to friends it was pointed out that maybe that is what people would like. Mylo leaves behind his wife, daughter and son followed by his parents, sister and brother. He had another family, his racing family. He was a great friend to so many of us and will be sorely missed but he has left us some wonderful memories. Mylo started racing in 2003 with his great and long time friend Herbie Ronan. The two of them had the same goal in racing, to compete in the Manx Grand Prix over the famous TT course. This was achieved very quickly when in 2004 they competed on Monday, August 30th in the Newcomer’s race. Mylo went on to receive 4 replicas, 4 more finishers medals and a top 10 finish in four visits to the Isle of Man with lap speeds of over 111 MPH. Mylo’s racing adventures went from strength to strength and with the help of Conor and Hozzo, Step Racing was born. Over the years new machines were added and Mylo moved well up the ranks. In 2008 Mylo finished the year in 5th position in both the Junior and Senior Support Championships. This culminated in Mylo getting the chance to race in the National races from 2009. This drove him work even harder. His training regime increased and he now had more goals to set. 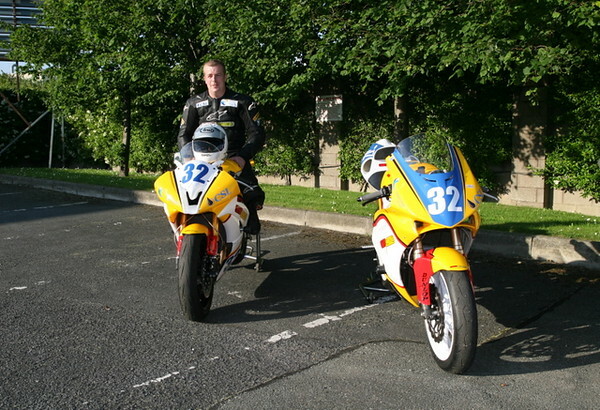 In 2010 Mylo, with the help of Steve Harnett from NDM, got to compete on a Superstock bike. 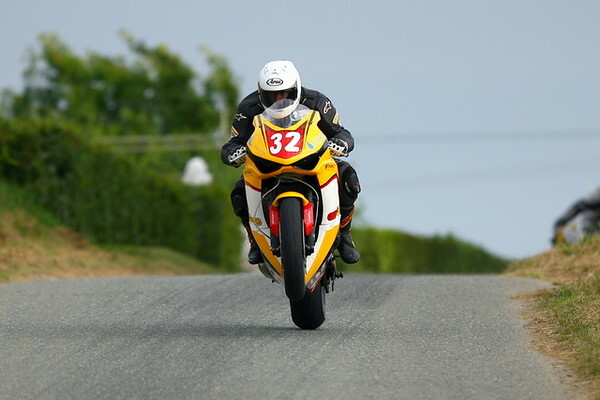 His first outing on it was when he made his debut at the North West 200. 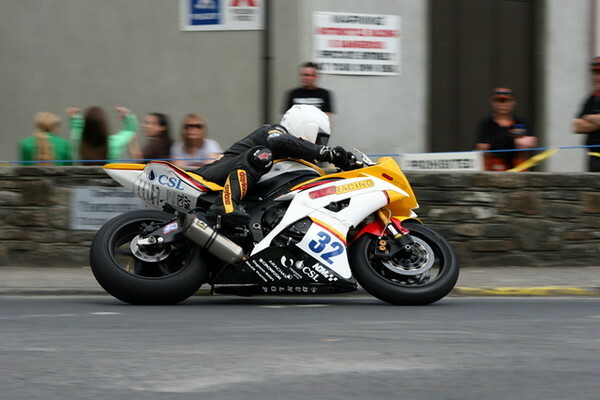 He was also due to compete at the other International events, the Ulster Grand Prix, Kells and Southern 100 this year. Mylo also put so much back into the sport. The Medical Team gained so much from him with help and experience in so many ways. One of his best friends and ex racer Richie Elliott and Mylo’s good friend Dr John Hinds are two of the best known members of the Medical Team. Mylo was a great supporter of the team and his van was a meeting point for them before and after a days racing. Earlier this year the team spent a day training and Mylo took a day out of his busy schedule to help. Like any racer Mylo wanted the best results he could get. But this all went out the window on a couple of occasions. At Tandragee in 2009 Herbie had a big crash which caused multiple injuries. Mylo having done a “First On Scene” course run by the Medical Team became the first on scene. He was off his bike like a light and by the time the medics had got to Herbie, Mylo had surveyed the scene and gave them vital time saving information. Then later in the year at the Manx Grand Prix while running well up the field, heading for a top ten finish, Mylo arrived at the scene of a crash in Whitegate, in Ramsay involving Keith Costello. This time Mylo stopped again to check on Keith, finding him to be OK Mylo remounted to finish a credible 32nd earning his 4th Replica. Mylo was a perfectionist; you just had to look at his bikes to see this. His preparation was meticulous. You just have to ask my wife, Anne, who was a great help to him in the last couple of years, it had to be done right or not done at all. Mylo had no problem in working on the bikes until 3am to make sure they where in top condition. He was one of the friendliest guys in the paddock and there was always a great supply of tea and coffee. You would always find Mylo parked near Herbie, Keith, Donna, Gareth and the rest of the Costello family and this lent itself to a fun weekend. You couldn’t say anything without getting a funny comment from him. He was great fun to be around and that cheeky smile was always there, I will never forget it. On 3rd July 2010 Mylo achieved two dreams. A national win by winning 1st in class on his trustee 400 machine and then to compete in a Superbike race around Skerries on a Superbike.